At around 01:00 local time on August 1st, the UN released a statement saying that a 72-hour humanitarian ceasefire effective from 08:00 local time had been agreed. The US Secretary of State further clarified that the IDF’s decommissioning of the cross-border attack tunnels would continue during the humanitarian ceasefire. Around an hour and a half after the humanitarian ceasefire came into effect, soldiers from the Givati brigade engaged in work to decommission one of those cross-border tunnels in the Rafah were attacked. Israeli forces responded with fire to the Rafah area, with prevention of removal of the abducted soldier from the area of course being a priority. At 10:04 – two hours after the truce commenced and half an hour after the attack on the Givati Brigade soldiers – missiles were fired from the Gaza Strip at the Kerem Shalom area and at around 12:30 more missiles were fired at Be’er Sheva and Ofakim. So let’s now take a look at how the BBC has represented that timeline of events of the morning of August 1st to its audiences. Part one of this post deals with content published on the BBC News website and part two will look at presentation of the story to BBC television news viewers. 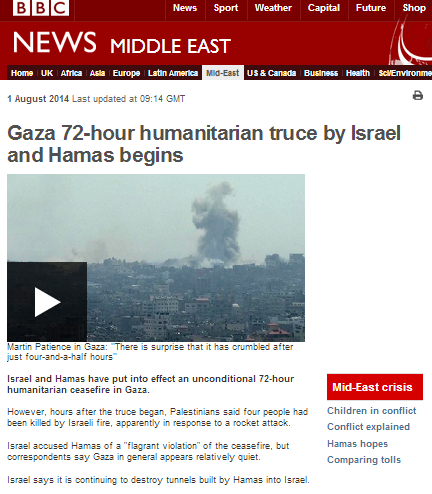 An article titled “Gaza 72-hour humanitarian truce by Israel and Hamas begins” published on the BBC News website on the morning of August 1st opens with some examples of the BBC’s practice of ‘last-first’ reporting. “Israel and Hamas have put into effect an unconditional 72-hour humanitarian ceasefire in Gaza. However, hours after the truce began, Palestinians said four people had been killed by Israeli fire, apparently in response to a rocket attack. “During the morning life appeared to be returning to some kind of normality in Gaza, with many Palestinians heading towards heavily shelled areas to see if their homes were still intact. But the Gaza health ministry reported that four Palestinians were killed and dozens were injured in an Israeli attack near the southern town of Rafah after the ceasefire began. “The Israeli military has resumed operations in Gaza, saying Hamas broke a planned 72-hour ceasefire just hours after it had begun. Only in the fourteenth paragraph do readers learn anything of the real timeline of events, but they are still not properly informed of the connection between the fire on targets in Rafah – which is presented without any context in the earlier parts of the report – and the attack on Israeli soldiers in the Rafah area and the missile fire into Israel. “Israeli foreign affairs spokesman Yigal Palmor told the BBC that Israeli forces had retaliated after being attacked in what seemed like a planned move by Hamas. “There was a full-scale attack on an Israeli unit and this unit had to respond,” he said. 12:20: Kate Benyon-Tinker BBC News, Gaza: Hamas’s spokesman Fawzi Barhoum said: “The Israelis are the ones who breached the ceasefire, and the Palestinian resistance acted in a way that ensures its right of self-defence. The world is demanded to immediately interfere to stop the ongoing massacres against our people”. 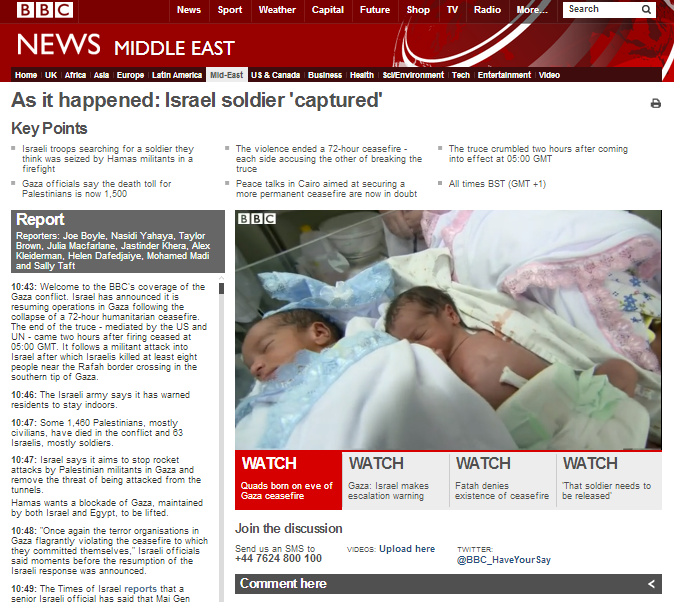 12:33: BBC Monitoring BBC News : The Hamas-run Al-Aqsa TV in an urgent caption at 11:15 BST cites Hamas spokesman Sami Abu Zuhri saying Israel’s claim that one of its soldiers has been captured in Gaza is “an attempt to mislead and to justify its retreat from the calm and to cover monstrous massacres especially in Rafah”. 12:52: The Qassam Brigades, Hamas’ military wing, have released a statement blaming Israel for breaking the ceasefire. They said that Israeli forces had moved into eastern Rafah overnight and had been met with resistance by Palestinian fighters this morning. 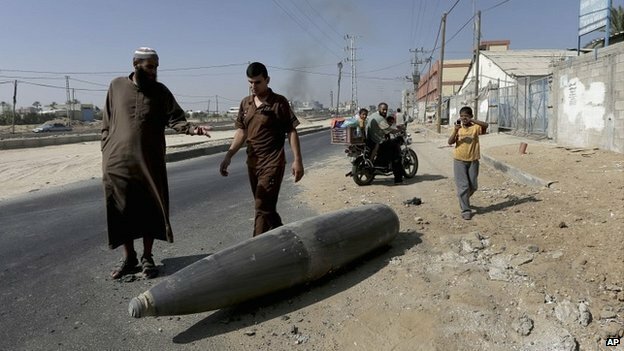 They also accused Israel of the random shelling of eastern Rafah. 13:01: Hamas: “We hold the Israeli occupation responsible for breaking the ceasefire and carrying out a massacre in Rafah”. 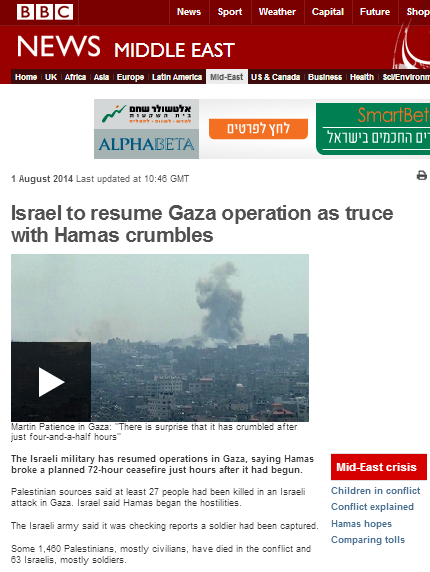 16:54: However, Fatah and Hamas both say it was the Israelis who broke the truce. 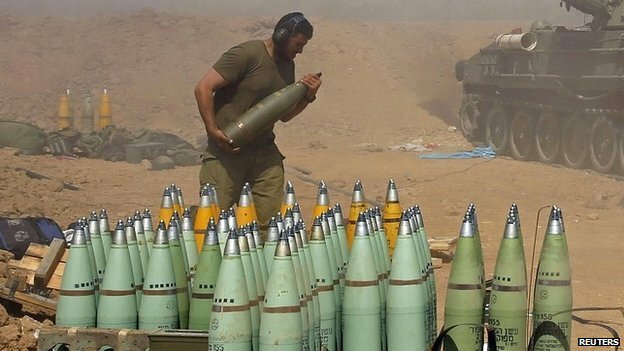 Fatah spokesman Husam Zomlot told the BBC Israel continued its bombardment throughout the ceasefire period. “Friday’s violence comes after a ceasefire brokered by the US and UN to give civilians a reprieve from the violence collapsed. During the morning many Palestinians headed towards areas that had been heavily shelled areas to see if their homes were still intact. 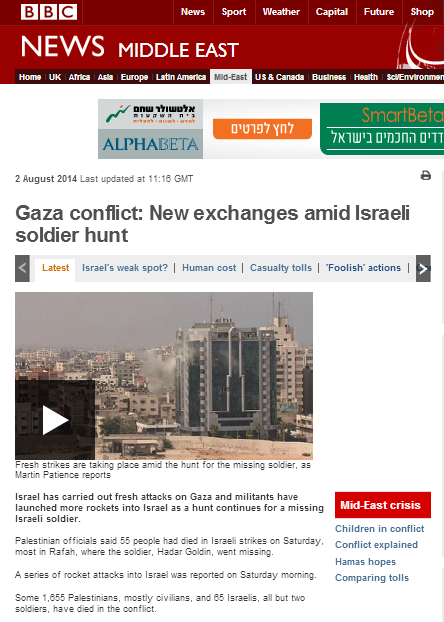 On the morning of August 2nd a report titled “Gaza conflict: New exchanges amid Israeli soldier hunt” appeared on the BBC News website but provided no better clarification to audiences seeking to understand why the humanitarian ceasefire broke down. “A 72-hour ceasefire had been agreed, starting from Friday morning, but collapsed hours later. As we see, none of the six items above adequately clarifies to BBC audiences the actual sequence of events. 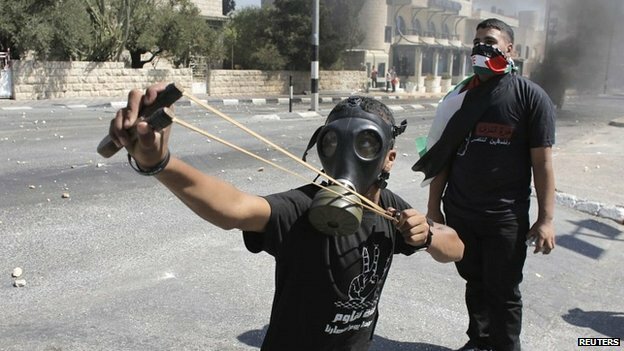 The incidents in Rafah are presented in a disjointed, context-free manner which fails to clarify to readers the connection between them and the preceding attack against Israeli soldiers. 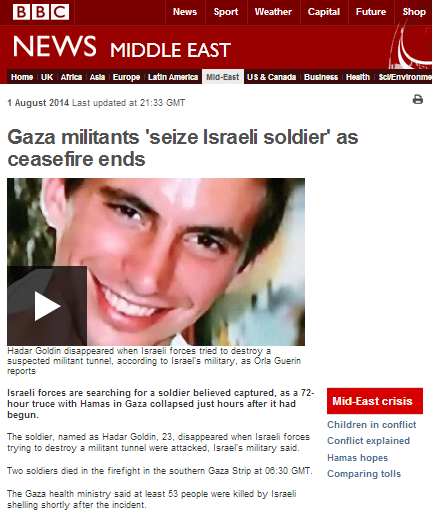 As usual, no attempt is made by the BBC to determine whether any of the casualties in Rafah were terrorists. 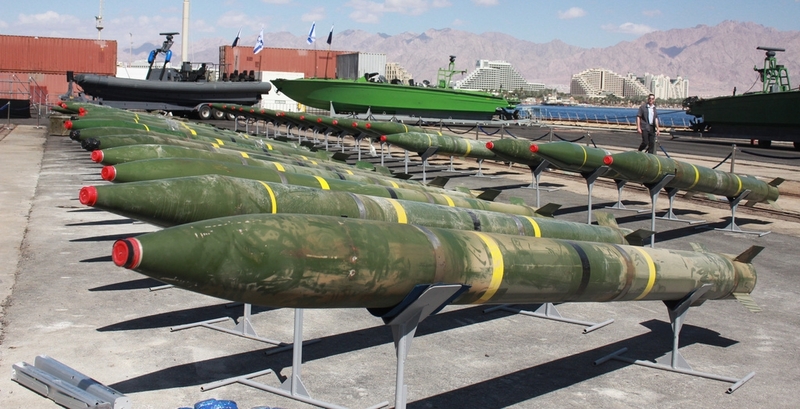 Hamas claims are presented to audiences as though they were plausible versions of events and the promotion of Hamas propaganda appears in several of the reports. Notably, no attempt is made to provide audiences with any perspective concerning the possible connection between Hamas’ obviously false claims and its need to placate its Qatari and Turkish backers as well as other parties which took part in brokering this latest humanitarian ceasefire. Part two of this post will look at the way in which the same events were presented to BBC television audiences. Perhaps the reader is supposed to infer that the shells used by Israel in the first picture is identical to the one in the second, but unless the Palestinians in the second picture are midgets, or the Israeli a giant, that couldn’t be the case. But our ‘world class’ media organisation, the BBC, aren’t interested in details like that, if they’re told by Hamas that they’re Israeli shells, it must be true, and they’ll do their best to make it true. Presumably the reader is supposed to think that the ‘demonstrators’ were only shooting catapults at the Israelis when they got killed. There is an online petition for the UN to investigate Hamas for war crimes. It requires 15,000 signatures to be submitted and at present it already has 14,494, requiring only 506 more. Breitbart London has more on it here though the petition page does an excellent job of putting its case.